Royalties are one of the main concerns for many authors and are simply the amount of money the author gets paid every time a book is sold. Royalties work differently for a traditionally published book and for self-published book but there are a few similarities. With either royalty type, the price of the book greatly affects the amount earned per book. The higher the price, the more money you will get. With traditional publishing you don't have control over the book price but with self-publishing you want to maximize your profit if you are publishing a Monetizing cookbook. The price of the book can also change greatly depending on the channel you are selling through. Selling a single book on Amazon will result in a higher cost-per-book and higher-royalty amount than selling 500 copies to a wholesaler. Royalties in traditional publishing are negotiated up front. They are usually paid in one of two ways. Either price-based as a percent of the retail price the book is sold for; or profit-based, dependent on the profit of the book. For example, if you have a 5% royalty on a book that sells on Amazon for $25 you could earn $1.25 with a price based royalty. If you are on a profit-based royalty, the profit of the book may just be $10 after expenses, so you would earn $0.50. Recently I was in negotiations with a traditional publisher to write a cookbook they could publish. Their initial offer to me, someone they were trying to convince to work with them, was a 6% royalty. That came to about $0.50 - $1.00 per book sold compared to the current $8-$10 I make through self publishing. So to bring in comparable royalties the book would have to sell about 10 to 20 times as many copies. Self publishing royalties are easy to calculate. Just take the total price you sold a book for, minus out any fees or shipping (usually Amazon does this automatically), and the remainder is the your royalty per book. Also, as a reminder, on Amazon even though the price will fluctuate, you still get paid for the full-list price. Here are a few examples of royalties. You have a book that costs you $10.00 to print and ship from the print-on-demand company you are using. The list price on Amazon is for $35. Amazon typically takes 40% to 60%, or say $17 per copy. So every copy that you sell on Amazon would get you $35 - $10 - $17 = $8 in profit. Since royalties are traditionally expressed in percents, you would be earning about a 20% price-based royalty. When selling the same book direct to a wholesaler, they may pay you 50% of the list price per book. So they put in an order for 100 copies of your book and will pay you $17.50 per book. Since the book still costs $10 to print and ship you would get $17.50 - $10 = $7.50 per book sold. Kindle, Nook, and other ebook royalties are usually paid at either 30% or 70% of the retail price. So if you sell a book for $10 on the Kindle, you will get $10 - $3 = $7 royalty per book sold. 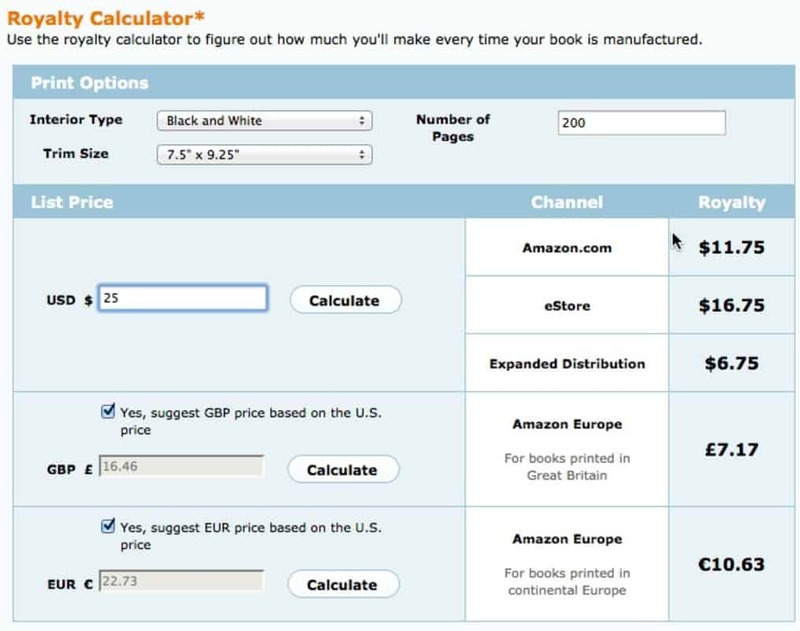 If you are working through CreateSpace, you can easily see what your royalty will be based on their royalty calculator. You can also buy books directly from them for wholesaling at much lower prices. Most of my print books earn $8-$10 per book sold through Amazon and $6-$8 per book sold wholesale. My books are published through CreateSpace, are black and white, about 150-250 pages long, and retail for $20 to $25. In additional to the higher royalities for self published books, you also have control over the royalty amount because you can adjust the list price. This allows you to increase royalties for Monetizing cookbooks to increase your profit or decrease the royalty for Marketing or Viral cookbooks in order to increase sales.